Charles K. Henry has resigned as president of the Laurelhurst Company. Once before Mr. Henry resigned and the board refused to accept his resignation. It has not been accepted now, but lies on the table, where it is placed at the last meeting of the board. The next meeting will be held, it is said, October 13. At that time Mr. Henry will be allowed to withdraw from the head of the company and Edward Cookingham, cashier of the Ladd & Tilton Bank, will be elected president. Mr. Henry is reticent about his resignation. He would say nothing for publication of the causes leading up to his action other than that he was tired of being a figurehead on the office. "I shall keep my stock in the Laurelhurst Company," said Mr. Henry, "and outside of the Ladd Investment Company I own more than any other holder. But I shall have nothing to do with the management of the company's affairs and nothing whatever with the selling of lots." Mr. Henry has made public his action through a legal notice which announces that he is no longer the head of the company. At the office of the Laurelhurst Company in the Corbett building, Mr. Henry's action was confirmed. "The resignation will likely be accepted at the next meeting of the board," said Paul C. Murphy, one of the vice-presidents, "and Mr. Cookingham will in all probability be elected to succeed Mr. Henry. There will be no change in the policy of the company and tomorrow we shall start an advertising campaign with the object of increasing the sales. About $2,000,000 worth of Laurelhurst property has already been sold and there is nothing to indicate a slump." It is said there is nothing behind Mr. Henry's action that will have any effect on the progress of the addition, which is one of the biggest undertakings of its kind ever started on the Pacific Coast. Any differences of opinion there may have been, it is said, between Mr. Henry and the rest of the officers of the company were purely personal disagreements over methods of sales. 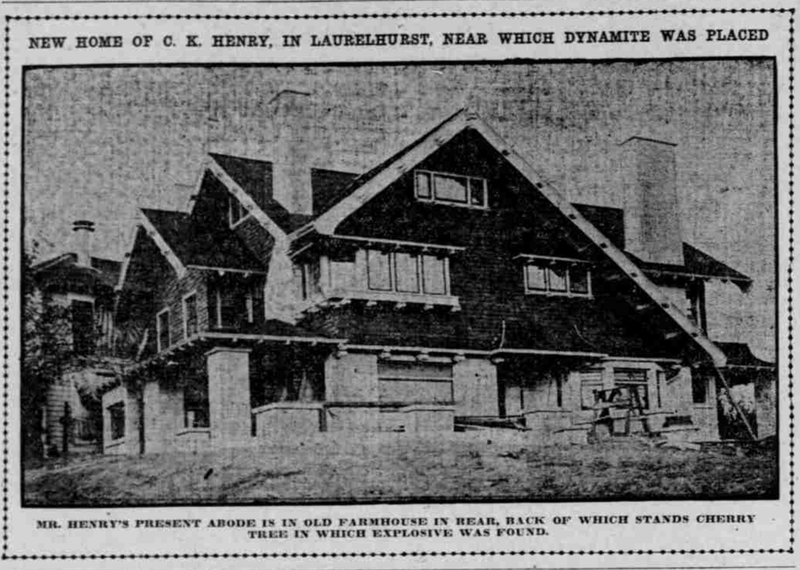 Six sticks of dynamite and a long piece of fuse were found wrapped in a gunnysack close by the temporary home of Charles K. Henry, at Laurelhurst, Tuesday afternoon. 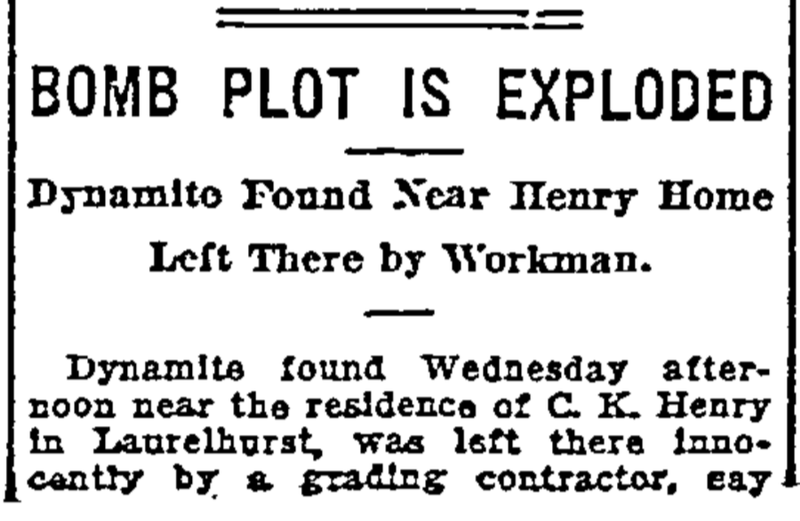 The discovery was made by a man named Cayo, who was working about the place for Mr. Henry. Fearing that it would mean a sleepless night, the workman said nothing to Mr. Henry about it until yesterday morning. Then he called him to the spot and showed his discovery. 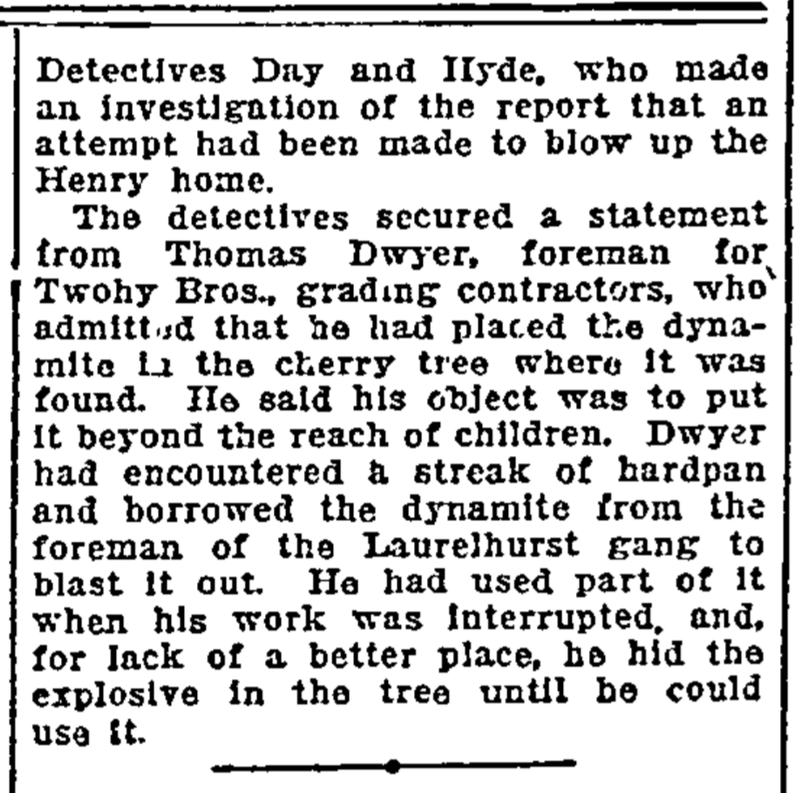 The explosive had been placed in the crotch of a limb of a small cherry tree, about six feet from the ground. No cap and no clockwork were connected with the powder--just the sticks and fuse. While Mr. Henry is waiting for his new home to be completed he is living in the old house that stood for many years on the knoll in the center of Hazel Fern Farm, the Ladd property which was cut up into the addition called Laurelhurst. The new house, which fronts on East Glisan Street, backs close up against the old, which faces east, on East 39th Street. The block which is bounded by these two streets, with East 41st and East Hoyt, has been laid out in landscape design for four building sites. The houses of Mr. Henry and Dr. H.I. Keeney, on this block, are nearing completion. Running along the side of the old house is a driveway and bordering this a row of little cherry trees. The one in which the explosive was found is about 50 feet from the two houses. It was shortly after sunrise yesterday morning and Mr. Henry was outdoors enjoying the beautiful morning. His man Cayo called to him: "I've got something over here I want to show you." Mr. Henry walked over to where the man stood, by the cherry tree, and saw the six sticks of dynamite and the fuse, which Cayo had taken from the sack. The powder was 7/8ths stuff. The sticks nine-inches long wrapped in yellow paper. "My first thought, of course, was," said Mr. Henry, "that some careless workman had left the powder there in the tree over night, but Cayo said at once that there had been no powder used in that part of the tract, and that the only use being made of dynamite in Laurelhurst was to blast stumps where trees had been cut down, more than three- quarters of a mile away. Besides, there is no possible excuse for a workman engaged in that part of the tract to pass anywhere near where I am living, either going to and from his work, or in the course of his duties. "So I had reluctantly to believe that the stuff had been placed in the tree with some sinister motive." "Now, so far as I know, my life has been an open book in Portland. There are only two reasons that I can think of why anybody should hold any animosity against me; one is the stand I have taken on the Broadway bridge, and the other is my attitude on the union labor question. I have not been so prominent in the bridge discussion as others of its opponents, although I have talked against if ever since the proposition was broached, so I cannot see why I should be singled out for an attack. Besides, the people who are advocating the Broadway bridge are not the kind that use dynamite to enforce its arguments." "I have always felt that the open shop was the only really just plan to pursue in dealing with the labor problem, and all the buildings with which I have had any connection have been built on the principle. It is true to Tuesday the first labor trouble in connection with the new Thompson Hotel arose but that did not come up until after the dynamite must have been placed in the tree back of my home. "That is a slight matter in itself. Before any work was done at all in wrecking the building that stood on this site I announced that the hotel would be built strictly on the open shop plan. Yesterday a non-union carpenter engaged in making frames for the concrete work that is to be done next was told by a representative of the Carpenters' Union that he would have to get a union card or quit the job. I don't want to be understood as saying that I hold union labor responsible. I do not know what to think. I am merely canvassing the situation and trying to find a possible clue. "I am really at a loss to account for the presence of this powder." Mr. Henry went on. "I can't bring myself to believe that Portland is to pass through any of the sad experience Los Angeles has had. I have received several threatening letters that came anonymously condemning my stand on the Broadway bridge question, and these went right into the waste basket. I have never been threatened for my opposition to the unions, though." After Mr. Henry reached his office yesterday morning he went to the City Hall and told his experience to Mayor Simon, who was horrified, but who could assign no reason for the dynamite. The Mayor at once promised the help of the police department and its protection. M. Henry also went to John M. Gearin, a United States' Senator, and took him out in his automobile to show him the dynamite. Mr. Gearin likewise was started and at a loss to find a motive for the apparent threat. Then Chief of Police Cost was consulted and the official expressed the same feeling of horror. He promised his department would do all it could to give protection, but suggested that Mr. Henry get a bodyguard, saying the department was so handicapped by lack of men and equipment that he could not guarantee to furnish a sufficient number of men to guard properly the premises and person of Mr. Henry. The bodyguard suggestion brought forth an indignant snort, and Mr. Henry made it distinctly understood that he had no fear personally. He said, however, that the dynamite-placer had frightened his family badly, and for that reason he wanted the matter sifted, if possible. 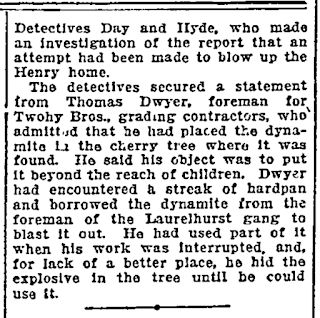 Captain of Detectives Moore assigned Detective Day to the case, to make an investigation and to learn, if possible, who left the dynamite in the cherry tree. Mr. Day said he had formed no theories, for he had not had a chance to examine the premises or the powder. This morning he will go out to Laurelhurst to see what clue he can pick up. 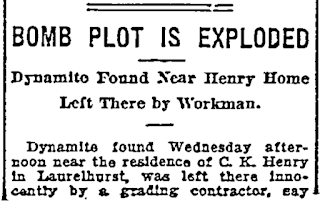 Dynamite found Wednesday afternoon near the residence of C.K. 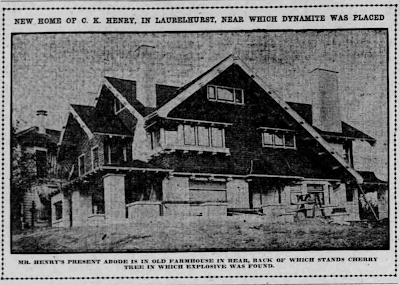 Henry in Laurelhurst, was left there innocently by a grading contractor, say Detectives Day and Hyde, who made an investigation of the report that an attempt had been made to blow up the Henry home. The detectives secured a statement from Thomas Dwyer, foreman for Twohy Bros., grading contractors, who admitted he had placed the dynamite in the cherry tree where it was found. He said his object was to put it beyond the reach of children. Dwyer had encountered a streak of hardpan and borrowed the dynamite from the foreman of the Laurelhurst gang to blast it out. He had used part of it when his work was interrupted, and, for lack of a better place, he hid the explosive in the tree until he could use it.